Let’s be honest, Kermit and co had been out there in the swampy wilderness for most of the new millennium until Disney bought the rights back in 2004 and slowly began reintroducing the gang into the public consciousness. Then they took the brilliant step of allowing life-long Muppets fan Jason Segel to write a brand new Muppets movie. Released in 2012 in the UK, The Muppets reminded us all why we loved Jim Henson’s creatures in the first place – they’re full of heart, have catchy songs and make you laugh. The Muppets was a hit with critics and audiences alike, making over $130 million worldwide, twice the amount of the franchise’s previous highest grosser. There’s no wonder the bosses at Disney hope to repeat that success with Muppets Most Wanted. While Segel was too busy with How I Met Your Mother and other projects to return for the latest movie, director James Bobin and The Muppets co-writer Nicholas Stoller are both back, and that fills me with hope. Also returning is Bret Mckenzie, one half of Flight Of The Conchords, and Oscar-winner for Man Or Muppet from The Muppets movie. If he can recreate the magic for Most Wanted then he could be on to a winner again. I also loved the use of previously recorded music in The Muppets including Simon & Garfunkels’ Me and Julio, We Built This City on Rock N Roll and even Camilla And The Chickens’ version of Cee Lo Green’s Forget You which makes me cry with laughter every time I hear it – not a good look when I’m on the train! A quick look at the soundtrack listing for the new film reveals it’ll feature Lady Gaga, Tony Bennett, the cast (obviously) and Jemaine Clement which basically means it’s going to be fantastic! So o returning Jason Segel or Amy Adams either, which means Muppets Most Wanted features an all-new cast. This time the gang are joined by Modern Family’s Ty Burrell, 30 Rock creator and star Tina Fey, and the brains behind and face of The Office, Ricky Gervais. Burrell should be giving us his best Inspector Clouseau as a French Interpol agent whilst Fey plays a Russian gulag officer. I can’t wait to see what they do with this. 4. The Cameos… Warning: Possible Spoilers! I don’t want to spoil this for anyone so please don’t read this bit if you don’t want to know (although this information is available if you google the film). Anyway, the Muppets always get the best-of-the-best in terms of cameos – remember the phone bank in the last film? This time round is no exception with Lady Gaga, Tom Hiddleston (wonder if he’ll do any impressions like this one?! ), Salma Hayek, P Diddy and even Dexter Fletcher all expected to appear (and that’s just the ones we know about). As a tease, Disney has revealed that Miss Piggy will be wearing a wedding dress designed by Vivienne Westwood in the film. Does this mean Kermit is finally going to make an honest pig of his porcine paramour? Or is it yet another bump in the road for the (some might say) mismatched duo? 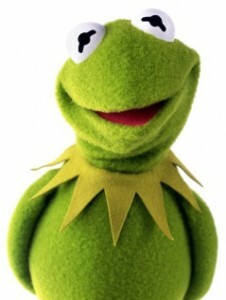 Everyone has a favourite Muppet; it might be Animal, Beaker or Kermit himself. For me, it’s Fozzie Bear. He’s been my favourite since I sat transfixed in front of the TV on a Saturday tea-time as a young child. I know his jokes are terrible, but he’s always made me laugh and he looks like he gives the best cuddles. 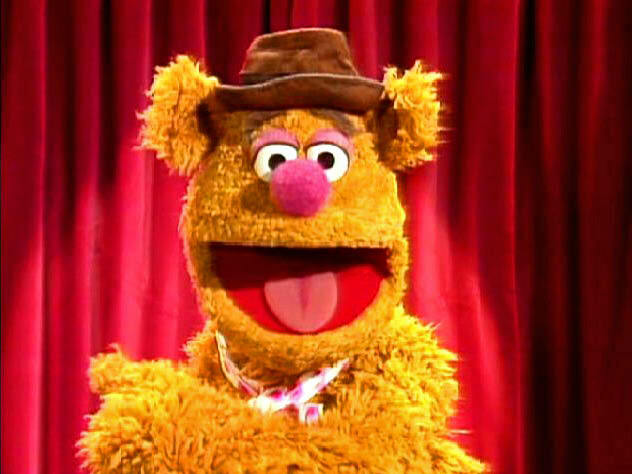 The thought of seeing Fozzie and the rest of the gang back on the big screen where they belong makes me very, very excited indeed! 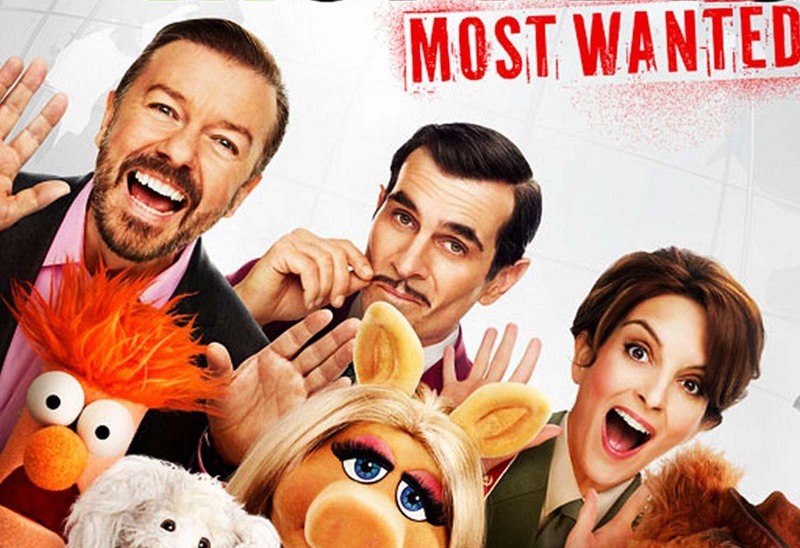 Muppets Most Wanted (U) hits the big screen in the UK on 28 March 2014, and is in US cinemas from 21 March 2014.